Certified organic. Made with organic cereals. An ideal complement to your baby's bedtime routine. Follow on milk with added organic cereals. Gluten free - as required by law. Why choose HiPP Organic good night milk? HiPP Organic good night milk is a special blend of high quality organic follow on milk and the gluten free organic cereals rice and buckwheat. It is satisfyingly creamy and the perfect end to a busy, adventure filled day. Specially designed to complement a mixed weaning diet, this milk drink can be incorporated into your baby's bedtime routine once a day from 6 months of age and is designed to replace your baby's normal follow on milk feed. It is not a breastmilk substitute. Preparing the feed Please follow preparation and feeding instructions carefully; failure to do so may make your baby ill. 1 Wash hands and sterilise all equipment following the manufacturers' instructions. If using a beaker ensure that this is thoroughly cleaned. 2 Boil freshly run water and leave to cool for no longer than 30 mins. Do not use artificially softened or repeatedly boiled water. Measure the required amount of water (referring to the feeding guide) into a measuring jug. 3 Measure 2/3 of the water into a sterilised bottle or beaker. Using the measuring scoop provided add the required amount of powder, levelling with the back of a clean dry knife. Do not press or heap the powder. 4 Place the cap on the bottle and shake vigorously until the powder has dissolved. If preparing in a beaker, stir well with a clean fork. 5 Add the remaining water and mix thoroughly. 6 Replace cap with a sterilised fast-flow teat or put on the beaker lid and allow to cool to drinking temperature (approx 37ºC). Check the temperature before feeding. Note: This formula mixes slightly better if prepared in a bottle. The milk can be transferred into a beaker after mixing. The cereals make this product slightly creamier than regular milk feeds; therefore if feeding from a bottle please use a fast-flow teat. Feeding Guide (1 scoop = approx 4.7g powder) Age: from 6 months; Amount of water: 6fl oz, 180ml; Number of scoops of powder: 6 scoops Age: from 12 months; Amount of water: 7fl oz, 210 ml; Number of scoops of powder: 7 scoops Important Feeding Information HiPP Organic good night milk is designed to be given ONCE per day, and should not be used more frequently. Please follow all instructions carefully; failure to do so may make your baby ill. Do not add any additional cereals or sugar to the milk feed. Only use the scoop provided in this pack. Always freshly prepare feed and use within 2 hours. Discard anything leftover at the end of the feed. Do not heat feeds in a microwave, hot spots may occur which could cause scalding. Please clean your baby's teeth after the last feed at night and introduce a cup or a beaker as soon as possible to prevent prolonged/frequent contact of teeth with milk feeds, which may increase the risk of tooth decay. A responsible person should be with your baby during feeding. Use within 21 days of opening. Important Notice Breastfeeding is best for babies. 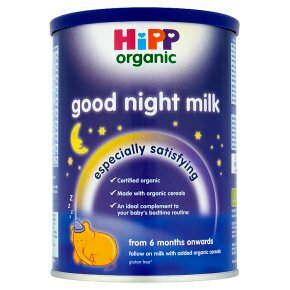 HiPP Organic good night milk is intended for use after 6 months of age, once a day only, as part of a mixed diet and should not be used as a breastmilk substitute before this age. The decision to start weaning, including the introduction of a follow on milk before 6 months of age, should only be made on the advice of a health professional, based on the individual infant's specific nutritional needs.